Utilizing exotic sources of genes (from lines originating in China and Brazil) to develop resistance to Fusarium head blight (FHB) in common wheat is an established practice in North America due to lack of comparable resistance (smaller phenotypic effect) in local germplasm and/or associated markers for ease of selection. 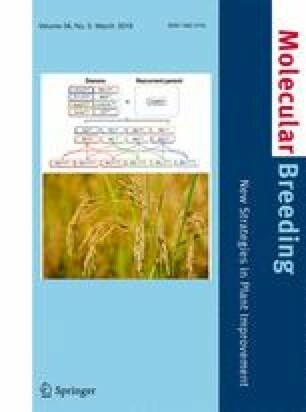 This study evaluated the effects of three major Sumai 3-derived FHB resistance genes Fhb1, Fhb2, and Fhb5, and other minor alleles inherited during crossing, on agronomic and end-use quality traits in hard red spring wheats from Canada. The BC3 derived near-isogenic lines in CDC Go (n = 38) and CDC Alsask (n = 32) backgrounds carrying all possible combinations of these three major genes were tested in six site-years. Among agronomic traits, introgressions resulted in lower thousand kernel weight and increased plant height with Fhb5. Among end-use quality traits, SDS-sedimentation volume, and grain protein content were affected. In addition to Fhb1, Fhb2, and Fhb5, we identified 10 loci in CDC Alsask NILs and 9 in CDC Go NILs that affected the traits measured. We found that none of these additional loci were common in both populations, indicating the presence of many alleles in exotic sources that can result in linkage drag. Linkage drag is largely dependent on the genetic background and the proportion of resistance alleles. Therefore, we observed more adverse effects in CDC Alsask NILs than in CDC Go. Improvements in FHB resistance can still be made by introgressing these major genes using marker-assisted selection and selecting rare segregants with improved agronomic and end-use quality. The online version of this article ( https://doi.org/10.1007/s11032-019-0957-8) contains supplementary material, which is available to authorized users. The first author (GSB) acknowledge the University of Saskatchewan Dean’s Scholarship, Saskatchewan Wheat Development Commission Graduate Scholarship, and Monsanto’s Beachell-Borlaug International Scholars Program (MBBISP) and other minor scholarships for financial support in his PhD program. The authors acknowledge technical support from Connie Briggs, Mike Grieman, Glenn Trowell, Krysta Wiebe, and Justin Coulson. PJH and GSB conceived the project. PJH, CJP, and HRK supervised and coordinated the research. GSB performed all the experiments, collected end-use quality data, analyzed, and interpreted data. GSB wrote the manuscript which was read and approved by all co-authors. The authors declare that all experiments in the study comply with ethical standards in Canada.